Flavors is the place with right retreat. 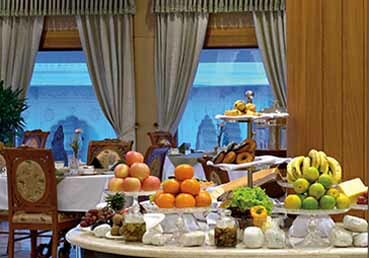 The royal dining hall is mated with world class quality service, along with finger-licking cuisines. Here, you will find every possible international dish along with continental and Rajasthani cuisines. The pleasure of tasting world’s best meal is mated with excellent services provided by our staff. Our staff of expert chefs promises you to serve you something that you have never tried before. The interiors of the dining hall are so decorated it completely suits your taste. The royal touch you will get while having your meal is just cannot be expressed in words. It can just be felt, by being a part of this luxurious event. You expect, and leave everything on us to meet your expectations. Along with this, the picturesque view of the royal pool will add an additional charm to your meal experience and will set up your mood right away.